This dear little building is so far from a major road that you will not come across it, except by accident. It sits beside a tiny lane between Woolpit and Stowmarket, a lane so narrow that I would recommend you more than usual to visit by bike rather than by car. This is a most unusual church, in several ways the most unusual in all of Suffolk. For a start, there is that dedication. King Charles I, as any schoolboy will tell you, was the monarch beheaded by the State in 1649. After the Restoration of the Monarchy in 1660, his memory, especially among Anglicans, was imbued with the status of a Martyr; and, although those deeply protestant times precluded this being sanctified or otherwise formalised in any way, several churches were erected in his name. Five in all England survive, and this is one of them. 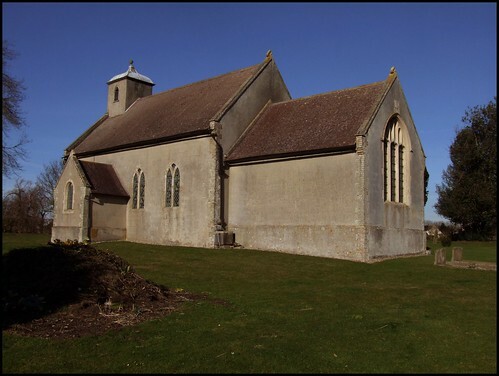 The church is unusual in another way, for it is what is known as a donative, a church building erected by a landowner, under his patronage, and with the living in his gift. As such, it is on private land; a semi-detached Anglican church, if you like. A third unusual thing is simply that 18th century churches are few and far between in East Anglia - there are less than a handful. But the most delightful curiousity is something inside, as we will see. The church was erected in 1767, on the site of a predecessor, from which the font survives. Otherwise, this is a largely typical prayerbook interior, with chancel gates and a double-decker pulpit rising above box pews. Mortlock argues that a combination of the church's newness and remoteness saved it from the Victorian restorers, although of course neither of these dissuaded them elsewhere. But it may be simply that it was actually approved of by them, since its beautiful interior decoration does not wholly conform to the pattern of the more spartan prayer book churches which the sacramentally-minded Victorians were keen to do away with. The Victorians are certainly responsible for the east window, but the two glories of the church are actually from earlier in the 19th century. These are the 1820 barrel organ, which plays 36 different tunes, and is the only one left in Suffolk, and the gorgeous 'gothick' interior decoration, the walls pastel shades, the roof beams salmon pink, and the chancel roof blue and stars. It is all delightful. Aside from the font, the only other older feature is a series of roundels of heraldic glass, some of which may be medieval. Coming this way for the first time in 1999, I couldn't help noticing a poignant reminder of the great retreat from the land in Suffolk during the 20th century on the south wall. 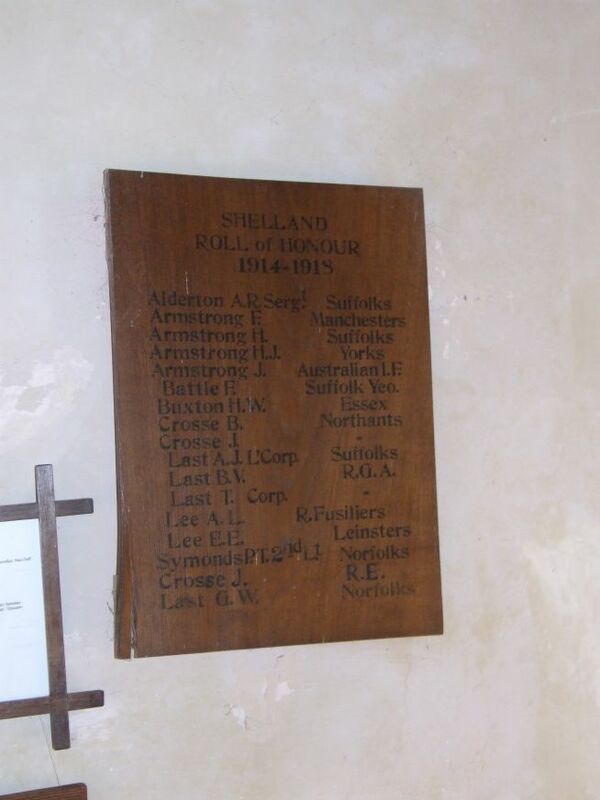 The village war memorial lists five names under the rebus of a shell end. Beside it, the current electoral roll listed just nine names. Since 1999, I have tried revisit whenever I could, usually when cycling along the back lanes towards Stowmarket to catch a train back to Ipswich. it is always idyllic, always open and welcoming. Indeed, this church is simply one of the most gorgeous confections in Suffolk, and as little known as near neighbours Harleston and Onehouse, both lovely too. Long may they sleep untroubled.